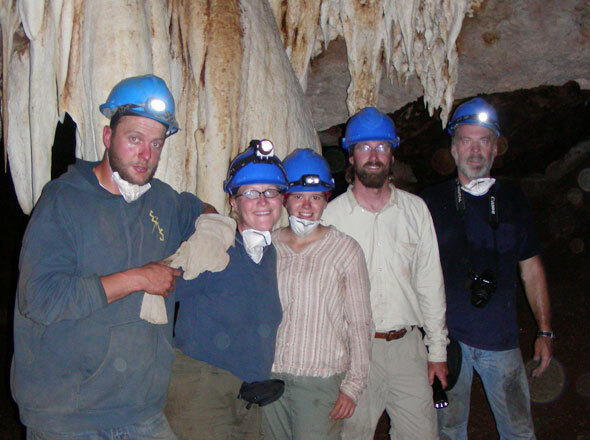 SHSU graduate student Tim Campbell, Texas A&M graduate student Juliet Brophy, SHSU junior Alicia Kennedy, assistant professor of biology Patrick Lewis and biology professor Monte Thies (from left) explore a cave in the Republic of Botswana that has had very few westerners inside as part of an archaelogical dig for fossils over the summer. —Submitted photo. The nearest water was more than five hours away; the nearest doctor, as many as four days away. They slept in tents, had no running water, subsisted mostly on canned food, spent their days digging in the dirt and traveled with a foreign military. It may not sound like an ideal way to spend your summer, but it was all in a day’s work for several members of SHSU’s biological sciences department. Assistant professor of biology Patrick Lewis, biology professor Monte Theis, junior Alicia Kennedy and graduate student Timothy Campbell were part of a team that spent six weeks this past summer in South Africa’s Free State Province and the Republic of Botswana, exploring cave sites and extracting fossils dating from one to four million years old. In the 1950s, the South African government was digging through a hill to put in a railway, and while doing so, they exposed buried sediments and fossils, including a 6-foot long mammoth tusk. Now known as the Meloding Railway Cut site, it has been dated to be over four million years old, according to Lewis, who has been working in South Africa since 2002 and is co-directing the current project with Darryl de Ruiter from Texas A&M University. “This is a time period in southern Africa that there’s virtually nothing known about, so it’s a real exploratory spot,” he said. The SHSU team spent about a month in the area, using a big backhoe in a field next to the railway cut to remove the sediment layer that was on top of the fossil layer and excavated a 15-meter square, he said. They then set up one-by-one grids, “like you would see in archeological excavations” to sort through and screen dirt. One “exciting” find for Kennedy included the mandible and maxilla of a lizard, “tiny little things,” Campbell said. The fossil lizard is Kennedy’s area of interest, or “focus organism,” as an undergraduate. The fossils uncovered by the SHSU team are still in South Africa. Lewis focuses on the small animals, and when these fossils are brought to SHSU they will be analyzed in his lab with the assistance of several students and colleagues. 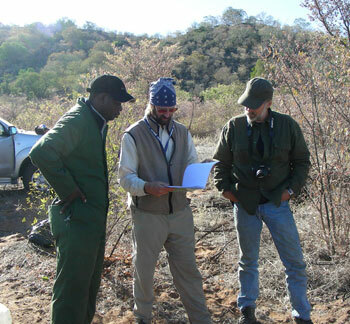 Gabidirwe, curator of paleontology for the Botswana National Museum, Lewis and Thies discuss their course of action before going inside the Tswana cave. Part of the SHSU team's goal is to build relationships with the Batswana so they can take over excavation when the team leaves. —Submitted Photo. Through his work in South Africa, Lewis became aware of the Republic of Botswana as an area that could provide him with information relevant to his research interests. Botswana is located in southern Africa, nestled between South Africa, Namibia, Zimbabwe and Zambia. This year, he and a team were given the opportunity to work with the Botswana National Museum to begin the process of excavating a cave site that preserves fossils between two million and a half million years old. The team of about 20, including Botswana people, spent approximately 12 days in the area for what Lewis called a “feeling out process.” At that time, the cave site hadn’t been thoroughly explored, and very few westerners had ever even been inside, Lewis said. “This year in Botswana was really geared toward seeing if we can work out there, if there was anything there to find and if we could get the support of the Batswana to help us to do it,” he said. It was a much more physical trip than the South Africa dig, he said. “We were having to squeeze through crevices full of bats and spiders, so it’s not a pleasant place to work,” Lewis said. The team was in Africa during its winter, and temperatures ranged from the 80s during the day to as low as the 20s at night. In addition, it has the highest HIV rate in the world, as well as issues with alcoholism. Adding to the uncertainty, at least at first, was the fact that they had to travel with the Tswana military, which has a semi-permanent camp nearby. “We really didn’t expect it,” Lewis said. “We didn’t know what they were there for, and my rule is usually the fewer guns at camp, the better. “They were really curious about everything we were doing, about the States,” Campbell said. “I would chat them up a lot; their view of the world and their view of American culture is a lot different than you’d expect.” One of Botswana’s official languages is English. The work itself was dirty; “miserable” even, they said. “People think it sounds cool, but you don’t really understand how uncomfortable you are and how you get dirty, and you just smell awful,” Lewis said. “The caves are filled with bat guano, so you’re crawling through bat guano and there are bugs and it’s hot, and then when you get out, there are no showers. The team was able to go to Africa through a number of grants they obtained specifically for the purpose, including funding from the College of Arts and Sciences. “The opportunity for an undergraduate to go to Africa and work on a real professional crew is extremely rare,” Lewis said. Campbell, who had taken a year off after graduating from the University of Rhode Island but had been to Africa twice previously, was recruited for SHSU’s biology graduate program after working with Lewis in Africa. Both Kennedy and Campbell would like to stay in academics as a career. Kennedy even “generated the contacts needed to continue with her scientific career, with the next step being a PhD program at the University of Texas,” said biology department chair Matthew Rowe. In preparation for next year, Lewis is taking his students to SHSU’s rock climbing wall for practice. They’re also planning on collecting books and supplies to send to villages.